When conducting a technical SEO audit, the more you know about a webpage, the more issues you can fix. 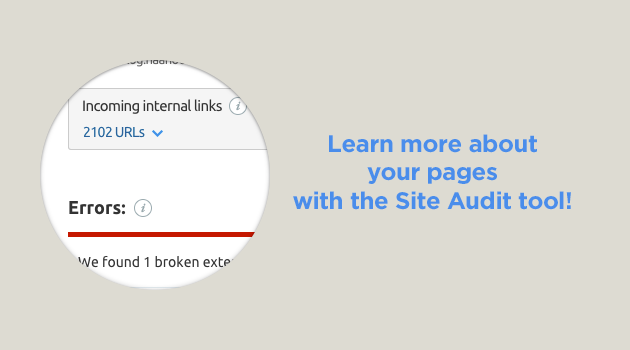 Now the Site Audit tool allows you to get more information about your webpages! 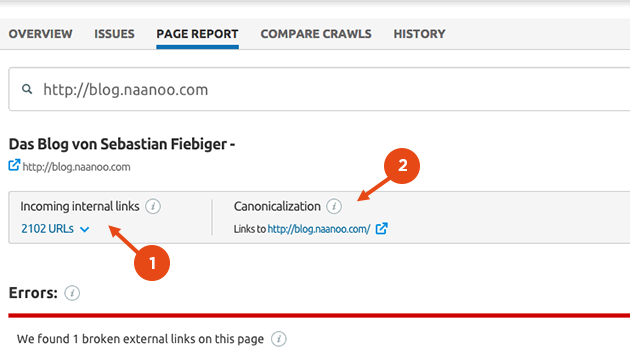 The Page report now shows internal links coming to a particular page. It displays the total amount of your website’s pages that are linking to a specified page (1), as well as the URLs of these pages. Knowing a page’s internal links is useful when you need to remove a particular page from your website. In this case, you know for sure from which pages you should remove links to this page, and avoid broken links. Also, if an analyzed page has a canonical attribute (rel=canonical), it will be indicated as well (2). The number of pages that refer to this page in their canonical attribute (<link rel="canonical" href="http://www.example.com/canonical-page" />) will be shown as well. Run your audit again, view the Page report, and conduct a deeper page analysis! If you don’t have any audit campaigns yet, you’ll need to create one. Pull SEMrush PLA data via API!